It seems fitting to finally share Becca and Dave’s celebration on the blog right before New Year’s Eve because these two had their first kiss on New Year’s Eve back in 2010! Becca and Dave’s wedding day felt like an adventure! These two decided to have an intimate ceremony at City Clerk’s office followed by an intimate dinner with family at one of my favorite places Freeman’s Restaurant in SOHO. We started our day in Brooklyn because this is where Rebecca and Dave have been living with their adorable pup Scout. Naturally, we did their first look in their backyard accompanied by Scout:) Walked through the gorgeous streets of Park Slope and stopped at Grand Army Plaza for photos. Next stop was City Hall and Becca’s father was let in right before they closed the doors for visitors! We were all anxiously waiting for him to arrive and I will never forget that moment and the couple of photos I shot of Becca breathing a sigh of relief that her dad was actually there to witness their ceremony. I knew then how important it was for Becca and Dave to have family there! After they said their I do’s we explored the neighborhood around City Clerk’s office which is actually very photogenic with its grand architecture. The celebration continued at the Freeman’s Restaurant in one of their private rooms on the second floor but we also did a couple of photos in the iconic Freeman’s Alley. Wishing these two more adventures exploring the world together and I really hope to return back to Dublin for a little visit and a glass of beer! Irish love on the blog! 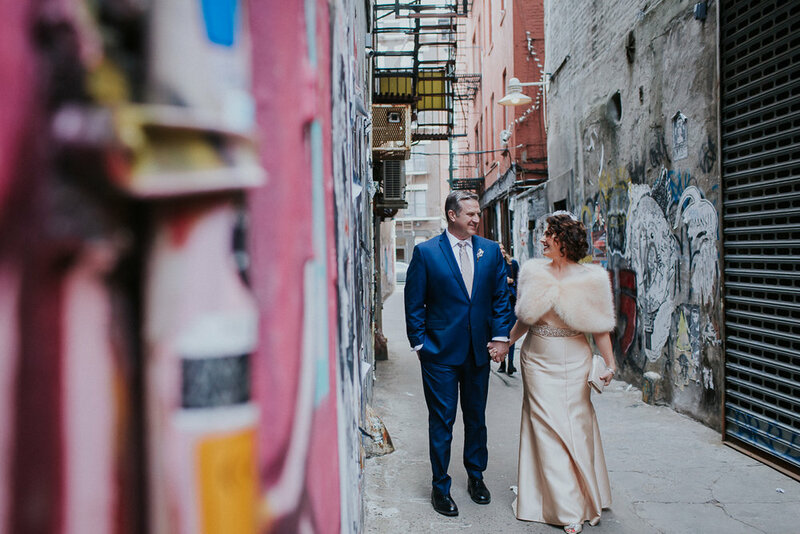 So thrilled to share this intimate wedding of Sophie and Tom who met In Ireland and moved to NYC to live together 2 years ago. It's hard to believe but this was January and these two were up for adventures outside around Dumbo for portraits before heading over to my favorite Freeman's Restaurant in Bowery. I am also obsessed with their apartment in Bushwick. Scroll down to see some very photogenic wall art;) These two had the perfect little ceremony followed by the funniest speeches by the family! Shoko and Yuchi wanted a whole tour of some of the most iconic spots in NYC for their post-wedding honeymoon photos and we totally did it:) These two traveled all the way from Japan to catch NYC in all its Fall colorful beauty. We started in Dumbo with the skyline views and found some hidden spots along the way, walked the Brooklyn Bridge and even managed to get some shots without a crowd of people in them:) We ended our session in Central Park! The foliage and the light were absolutely stunning on this perfect November morning in New York City. It's time to share some winter love stories on the blog:) How about a couple who after years of not seeing each other met at a breakfast with a friend and found out they both had male boxers named Gus?! Meant to be for sure! I had a little adventure with Katie and Daniel back in December. These two came all the way from Australia after falling in love with the big city on a prior trip. We met up in Central Park and we climbed some rocks, drove around the city in yellow cabs, were trapped by tourists on the High Line and finally made it to City Hall for their ceremony:) To celebrate we hiked the Brooklyn Bridge for some final photos! When two Aussies get eloped in NYC and I get to document the process magic happens! Couldn't be happier with how everything turned out although we spent half the time in traffic:) I love when couples let me document a few moments in the hotel room beforehand and you can just see and feel all the excitement and anticipation! This was also my first time photographing an elopement ceremony near Gapstow Bridge in Central Park. I have to admit it's one of my favorite spots now:) It's quite hidden from the crowds and yet you can still see the city skyscrapers! We finished our session all the way in Brooklyn with the best city views in Brooklyn Bridge Park. Lisa and Hunter had a beautiful touching ceremony in Avalon Park, Long Island back in June and I am thrilled to finally share their elopement photos here. Their ceremony was so intimate and so full of unique touches including a handfasting ceremony which is an old celtic tradition. They had their closest friends and family there and it was truly an honor to witness these two get married. I could feel the excitement and happiness radiate from everyone present! Following the ceremony Lisa and Hunter organized the most epic sparkler/smoke bomb exit so scroll down to see some of the fun moments:) Happy 2 month anniversary to these two! The best 2 hours I spent photographing in December was during this fun elopement session with Megan and Mark! I just loved their energy and quirky personalities:) Sometimes I forget how exciting it must be to be an ocean away from your home and get married with your photographer being the only witness:) I could certainly feel and see that excitement shared between these two lovebirds! And how lucky we were with this incredibly warm sunny weather in December! Happy 1 month anniversary, Megan and Mark!